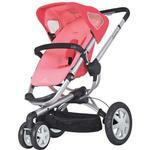 The Quinny Buzz features a clever automatic fold that opens into a truly versatile pushchair. With the flexibility to carry a comfy car seat or the included cozy bassinet its the ultimate combination of comfort for your child and ease of use for you. The included Dreami Bassinet is designed for children from birth to 20 pounds. It includes a mosquito net, rain cover, mattress, blanket and wind protector to make the Dreami a complete comfort package. 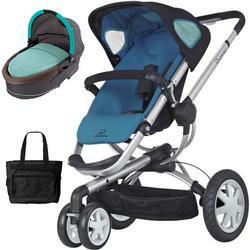 The Quinny Dreami Bassinet locks onto the Quinny Buzz Strollers light frame, and can be swapped with the standard Buzz seat when needed. 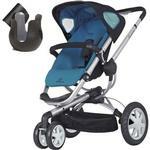 The Buzz stroller can still fold down with the Bassinet attached. It detaches from the frame easily, and has rubber feet so that you can set it down without soiling the fabric. Its thick foam mattress is soft and comfortable and the adjustable canopy will provide shade from the sun. The 3-point harness will keep baby secure while out strolling. The Quinny Dreami Bassinet locks onto the Quinny Buzz Strollers light frame, and can be swapped with the standard Buzz seat when needed. 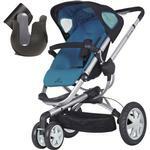 The Buzz stroller can still fold down with the Bassinet attached. It detaches from the frame easily, and has rubber feet so that you can set it down without soiling the fabric. 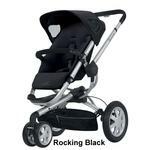 It provides the ultimate in comfort allowing your baby to travel lying flat. Its thick foam mattress is soft and comfortable and the adjustable canopy will provide shade from the sun. 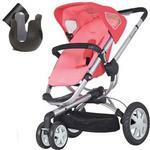 The 3-point harness will keep baby secure while out strolling. The Dreami Bassinet includes a mosquito net, rain cover, mattress, blanket and wind protector to make the Dreami a complete comfort package. Ages birth to 20 pounds. 33"H x 15.5"W x 9.5"D.